Description: Shrub 30–60 cm high; branches with white matted hairs, sometimes ± glabrescent. Leaves usually in whorls of 3 or sub-opposite, linear or sometimes linear-lanceolate, 7–25 mm long, 2–6 mm wide, margins recurved, upper surface wrinkled and ± sparsely hairy, lower surface grey-tomentose; sessile. Cymes sessile or shortly pedunculate, arranged in terminal subglobose clusters or usually forming distant whorled clusters, 1–3 clusters per node and each 5–7-flowered; bracts 3–4 mm long. Calyx tube 2–3 mm long; lobes 3–3.5 mm long. Corolla 7–9 mm long, purplish blue; lowest lobe 3–3.5 mm long, others 2–2.5 mm long. Stamens usually 4, exserted. Fruit 2–2.5 mm diam., silky. 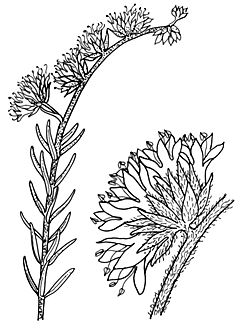 Distribution and occurrence: Grows in spinifex and low shrubland communities on deep sandy soils of semi-arid to arid areas, in the Enngonia-Barringun district.